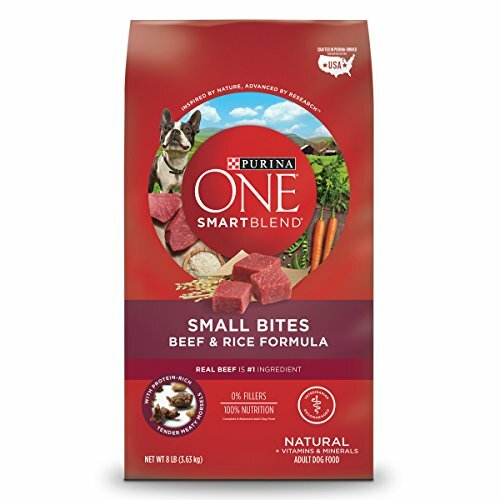 Your adorable short-snouted pug needs good nutrition derived from dog food. 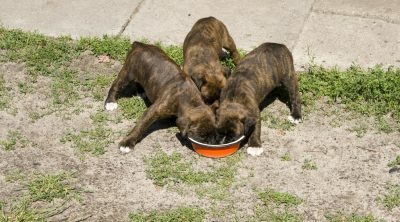 Commercial dog food brands can greatly vary in quality, price, and breed-specific requirements. 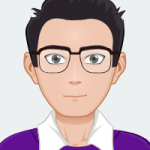 This guide will help you distinguish between the best dog food for pugs, and the not so good brands. Is it okay to buy generic dog food brands for your pug? Should you put your pug on a grain-free diet? Read the below guidelines to find out. 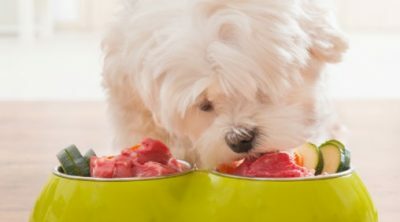 What Type of Dog Food is Best for Pugs? How Many Calories Does Your Pug Need to Consumer Per Day? Pugs are small dogs that are officially classified as toy dogs by the American Kennel Club. However, pugs are the largest of the toy breed type dogs. They can be quite heavy compared to other toy breeds like Maltese or poodles. Pugs can weigh as big as 18 pounds. Therefore, your pug can consume commercial food for small and medium sized dogs. Here’s the thing about small breed dog food: the kibble contains high amounts of calories. As pugs are prone to being overweight, small breed dog food might not always be suitable for them. But this is highly relative. Most pugs do well on toy breed dog food, as long as you watch out for how many calories they consume. As adorable as pugs can be, there are special health conditions that affect this breed. Owners should thus take care to purchase pug food while paying attention to these conditions. Pugs are a short-nosed breed, which is why many people find these dogs so cute. This short nose can adversely affect the pug, however. Pugs tend to have breathing difficulties because of the shape of their noses. That means your pug can’t exercise as well as other dogs. Limited exercise usually also means that your pug is prone to being overweight. Therefore, as a responsible pet owner, you should be careful when feeding high-calorie food to your pug. Pugs are additionally prone to hip dysplasia. This condition causes the ball and socket parts of your pug’s hips to connect incorrectly. Pugs with hip dysplasia have trouble walking. Later in life, these dogs are at risk for arthritis too. 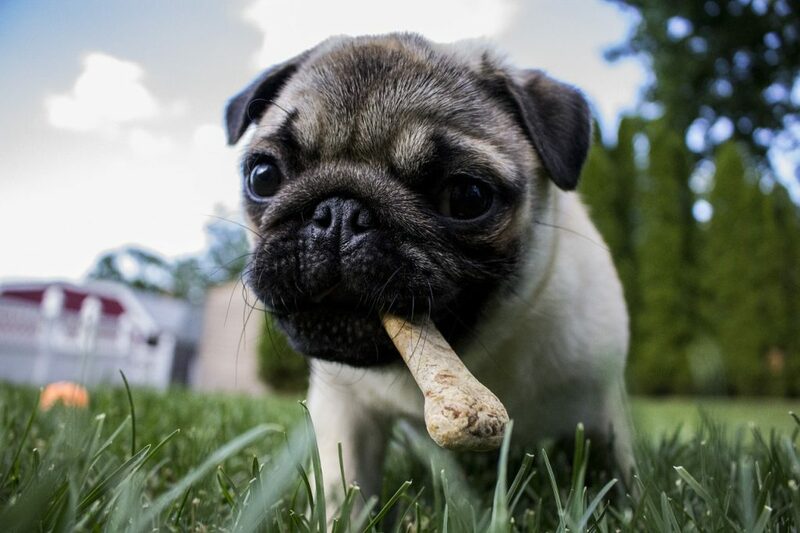 Because of bone issues, it’s recommended to give your pug dog food enriched to keep bone tissue healthy. It’s recommended to look for commercial dog food with supplements like chondroitin and glucosamine. Pugs are infamous for their sensitive skin. Pugs are quite prone to allergies and demodectic mange. These are immunological issues with no easy solutions. But you can reduce your pug’s sensitiveness to store-brought food. Avoid certain artificial preservatives to reduce stomach sensitiveness to new food. Because of the many health issues pugs face, it’s recommended to give them a grain-free diet. It’s best if the only grain in your pug’s food is rice. However, that doesn’t mean pugs cannot tolerate grains derived from maize. Going grain-free is only a possible preventative method. Ask your veterinarian for specific ways to buy dog food that doesn’t irritate your pug. It’s difficult to say how many calories a pug needs because it varies between individual dogs. How many calories your pug should consume is based on its age as well. A pug puppy should consume about 55 calories per pound of body weight. Adult pugs need 40 to 45 calories per pound of body weight. Senior pugs have fewer calorie requirements, and need only about 40 calories per body weight pound. Keep in mind, though, that above are only generic calorie requirements. Your pug’s calorie requirements would vary depending on its activity level and other health concerns. Therefore, when buying dog food for pugs, don’t measure the quality by calorie count. You should feed your pug, whether adult or puppy, three times a day. Your pet would need snacks in between as well. Feeding your pug on time is very important to prevent issues like bile throw up, which is caused by an empty stomach. If your pug is overweight, as determined by a veterinarian, ask the vet for a meal plan. You may need to buy special food to manage the pug’s weight and prevent the obesity from getting worse. The most important ingredient in dog food your pug needs is protein. After that comes the fat. Dogs in the wild derive protein from animals they kill. 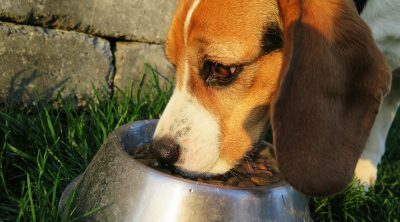 But commercial dog food also contains proteins and fats sourced from plant material. In other words, the protein and fat in commercial dog food are not all made the same. 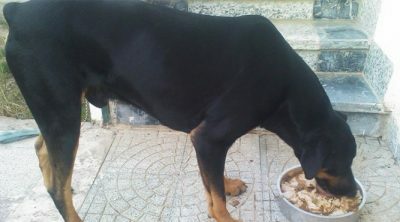 Good-quality dog food contain proteins sourced from whole animals, such as chicken, lamb, beef, or fish. The first listed ingredient in a dog food brand should always be a whole meat. Not meat meals or by product. Specified meat meals, such as chicken meal or beef meal, is fine. That means the meal is derived from muscle and bone of the specified animal. But be wary of generic meat or poultry meal labels. Compared to whole meats, specified meat meals contain less water. So the dog food with meals has more protein as a percentage. The dog food brand should also contains sources of fat. The fat ingredients should be named as animal fat. Fat is essential for pugs as sources of omega-3 and omega-6 acids. Also, fat makes the food more tempting to dogs. Other than fat and protein, the dog food would have sources of vitamins. Vitamin and some other ingredients might be plant-derived. In that case, as your vet whether the plant-based ingredient is suitable for your pug. 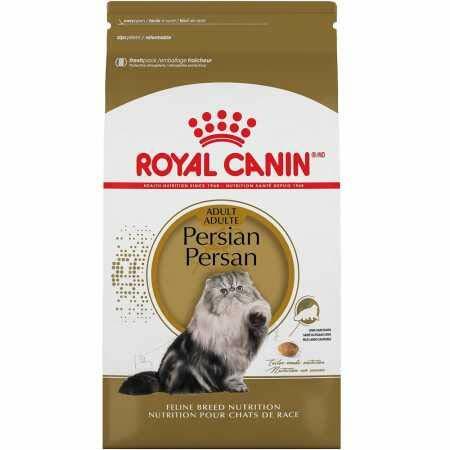 This is one of the handful of breed-specific dry dog food available for pugs. It’s a bit on the expensive side, but the ingredient list prioritizes protein and avoids foods pugs can’t tolerate. The main ingredient in this brand is chicken meal, followed by brown rice. The main fat source is chicken fat. The ingredients does contain corn, other rice, and wheat gluten. There’s some anchovy oil as a source of DHA, according to the label. The overall recipe is well enriched with minerals and vitamins. It includes vitamins A, B1, B12, D, and E as added supplements. It gets minerals from tea and rosemary extracts. Overall, the recipe is about 28 percent protein and 20 percent fat. That is a well recommended ratio for pugs. Most commercial dog foods manage around 15 percent of protein. There are other features of this dog food brand that might be beneficial for your pug. The kibble is exclusively designed to be easy for short-nosed pugs to pick up and eat, according to the brand. The recipe has L-carnitine, which Royal Canin says helps your pug’s muscle tone. Some owners might be concerned about the what and herb extracts in this recipe. You can ask your veterinarian for advise regarding individual ingredients. Your senior pug needs age-specific dog food to meet its nutritional needs. 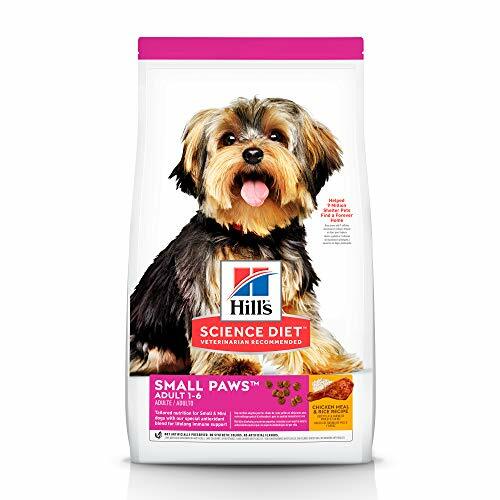 Hill’S Science Diet formula for older toy breed dogs is one of the best known brands for this purpose. There are two varieties in this brand for dogs 7 years or older, or 11 years or older. 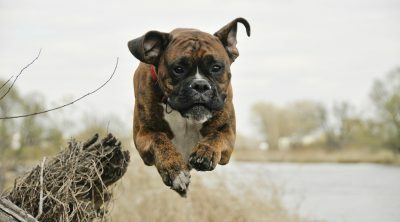 The recipe is specially formulated for toy breeds under 25 pounds. The recipe mainly has sources of protein and calcium in it. The main ingredient is chicken meal, followed by whole grain wheat and brewer’s rice. It contains pork fat and iodized salt. The total concentration of crude protein is 21.5 percent. According to the brand, the recipe includes a clinically balanced blend of vitamins and minerals. The vitamin supplements in this recipe include vitamins A, B, C, and E.
Hill’s calls this formula “easy to digest” for small breed dogs. You can ask your vet about this, especially if your older pug is experiencing bowel issues. To be convenient for owners, this dog food comes in an easily resalable bag. The idea is to keep the dry kibble from getting soggy. The price is on the affordable side as well. This dog food is packaged in the U.S., but the ingredients are sources from globally. Hill’s doesn’t specify the countries. If you are concerned about low-quality ingredients ending up in the mix, ask the manufacturer for specifics about ingredient sources. Pug owners who obsess over the protein content in pet food might like this recipe. This dog food brand has not one, but three main sources of protein: chicken, chicken liver, and dried egg product. Preserved chicken fat is also included. The brand guarantees that this product doesn’t contain any rendered meat meals or by products. The product contains some grains, and they are derived from non-GMO fruits and vegetables, according to Halo. The proteins come from whole animals as the brand says. The product comes with a proclamation that says the meat products are from animals raised without antibiotics. The product is said to contain no artificial flavors, colors, or preservatives. This kibble might be suitable for pugs with digestive sensibilities. The nutrient-rich kibble is small enough to nibble. The product also comes with a high digestibility rating provided by an independent U.S. lab. 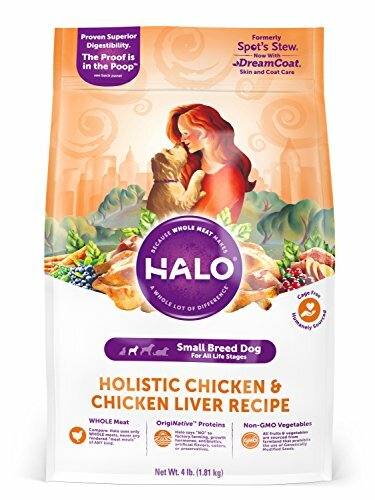 The Halo kibble does contain soy proteins, and fats and proteins derives from flaxseed and peas. It contains some dried fruit, including blueberries and cranberries. Some dogs may not tolerate berries well. So you should definitely ask your vet if berry-included kibble is suitable for your dog. 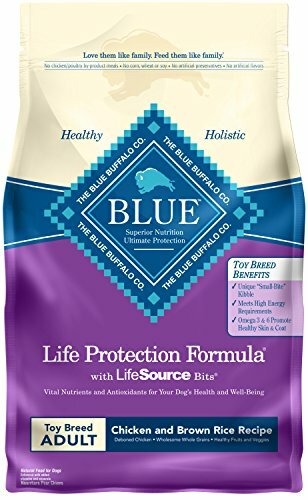 Blue Buffalo is one of the better known dog food brand names. The recipe for small and toy dog breeds have kibble with higher concentrates of protein and carbs. This formula would most likely suit active dogs. If your pug is at risk for obesity, then you might want to skip over this product. The chicken and brown rice recipe contains real meat as first ingredients. The first three ingredients are deboned chicken, chicken meal, and whole ground brown rise. Other ingredients include grains including oatmeal, barley, and peas. Preserved chicken fat is also added. The kibble includes Menhaden fish meal as the source for omega 3 fatty acids. It has a lot of vegetable, fruit, and plant oil derivatives that you might want to eyeball over before buying. The kibble in this brand is really tiny. It’s designed for small dog mouths, such as for Chihuahuas. It might suit finicky pugs, especially those with bad teeth or don’t like to chew a lot. The brand assures that recipe contains only the “finest natural ingredients.” It is, however, enriched with vitamins and minerals. Blue Buffalo guarantees that the products contains no chicken or oultry by products, meals, corn, soy, what, artificial flavors, or preservatives. If you are looking for a protein and fat dense kibble for your pug, this recipe might suit your needs. 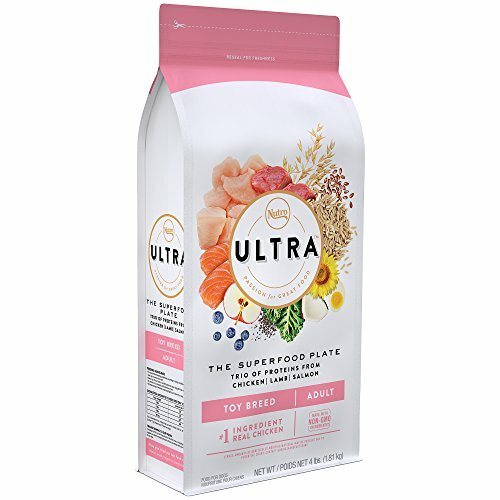 The Nutro Ultra derives proteins from three sources: chicken, lamb, and salmon. The kibble is 27 percent protein, 16 percent fat, and 4 percent fiber. The main source of protein is chicken, which is the first listed ingredient. After that comes chicken meal and whole brown rice. Lamb meal is the fifth listen ingredient. Salmon meal is the ninth listen ingredient. The product doesn’t contain whole fish. The ingredients list doesn’t include in by-product meals, what, soy, corn, or artificial flavors, colors, or preservatives. This recipe, however, has a “superfood” tag to it. That means the manufacturer includes a number of people food in the recipe, such as coconut, kale, blueberries, and chia. While kale and blueberries are good for you as a human, these ingredients might not suit your pug. These ingredients are not necessarily detrimental to your pug. But it’s best to check with your vet, especially if your pug has a sensitive stomach. All in all, this kibble is rich in proteins and fats your pug needs, even with some unnecessary filler. The price tag is quite affordable as well, so it’s worth considering. This is probably one of the best recipes if you want to give your pug non-poultry based kibble. This recipe is made from beef and rice. The first three listed ingredients are beef, rice flour, and corn gluten meal. The beef is named as a source of glucosamine. It’s a natural compound present in cartilage of whole meat. People take glucosamine to help with inflammation associated with arthritis. Pugs at risk of arthritis may benefit similarly. While this formula contains a number of great ingredients, some owners may take issue with other ingredients. Soybean meal and soy oil is part of the recipe. So is chicken-by product meal. Chicken by-products are not outright bad for your pug. But it may contain parts like beaks and features that your pug may not otherwise eat. The kibble is flat and triangular shaped. It’s designed for very small dogs like teacup poodles. It will most likely suit smaller pugs. 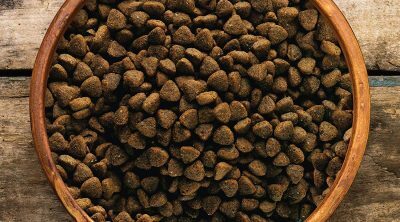 This kibble is best suited for pugs who don’t like scarfing down on bigger chunks of kibble. This brand is slightly on the expensive side, but not too much. If your pug likes it, you might not mind spending several extra dollars. There are lots of popular dry kibble available for small and toy breed dogs. But the best recipe for pugs is hands down the Royal Canin adult dry dog food. The reason is simple: the recipe is specially formulated for pugs, not generic small breed dogs. The recipe also contains a solid concentration of protein and fats that you pug needs to stay healthy. The kibble is well supplemented with vitamins and minerals as well. The shape and size of the kibble is small so your pug can easily eat it. The formula is a bit expensive compared to others reviewed above. But it’s a rare breed-specific recipe that pug owners shouldn’t overlook. Of course, not all pugs like the same type of food. Therefore, you can consider the other product reviews to consider which recipe might suit your pug the best.